Do hidden treasures lie within your wardrobe? 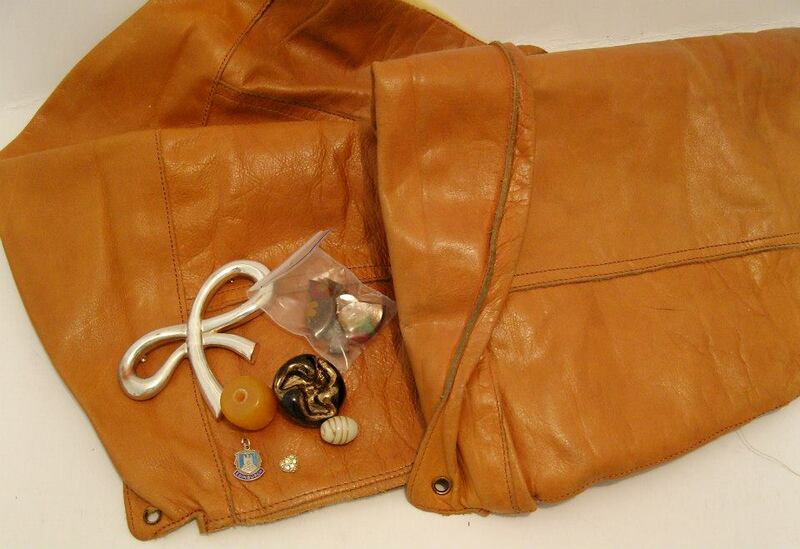 Do you own leather jackets & skirts from the 80's which hold fabulous memories but that are now completely unwearable? Or gorgeous leather knee length boots which your cobbler just refuses to put yet another heel on? Perhaps you have a luscious leather clutch bag with scratches or marks created by wedding flower corsages? Well now you can have them transformed into a unique clutch bag or other accessory. We can lovingly deconstruct your old leather goods & restyle to create an accessory that suits your personality. You may decide to keep the original features of that electric blue cropped leather jacket & make it the focal point of a new handbag. Or perhaps you would like sections of your well loved leather boots revamped into a fabulous clutch bag, adorned with sentimental buttons & a big brooch that normally hides in a drawer. Most leather items can be revamped as long as they are clean & in presentable condition. Items which work particularly well are knee length boots, long jackets and skirts. New accessories can be made by taking apart the existing item and reassembling it. Sections of worn and damaged leather items can be reinvigorated with new elements such as large bows or a selection of buttons. Where possible embellishments will be hand sewn or machine stitched, but in the event of this not being possible, strong contact adhesives may be used. Please allow up to four weeks for completion of your order. Personal appointments to discuss your requirements are available. If you are unable to meet in person, do not worry as ideas can be discussed via email or telephone. Prices are dependent on individual commissions.